I’m re-reading Victor Hugo’s Les Misérables after 20 years. Start with part 1, go back to read about a failed mugging, or read on! The musical condenses an extremely long courtship between Marius and Cosette into the cliched (but much easier to stage when you’ve got other story to tell) love-at-first-sight moment. In the book, they have months of flirting across the park in summer, then lose sight of each other, then almost meet just before the attempted robbery in February, then nothing for several more months. Because this is Les Misérables, and coincidences abound, the soldier is Théodule Gillenormand. Yes, Marius’ cousin. Katie suggests that maybe Hugo got tired of introducing new characters. If so, it certainly took him a while. Cosette doesn’t scare easily. Years with Valjean and at the convent have counteracted the anxiety of her childhood, allowing the “gipsy blood in her veins” (I wonder if this was a standard phrase at the time, or if Hugo is adding a bit to her background) and her adventurous nature to reassert itself. Hugo compares her to a lark. For something I didn’t remember at all from the first read-through, that nickname keeps recurring an awful lot. 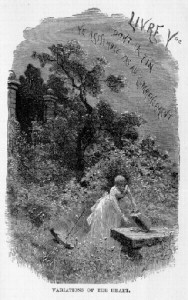 One night that spring, Cosette hears footsteps in the garden. She goes to the shutters to peek out, but no one’s there. 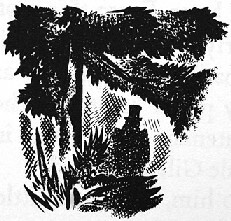 Another night she’s out in the moonlit garden, and sees the shadow of a man wearing a hat, walking a few paces behind her. She looks around, but again no one’s there…and when she looks back, the shadow has vanished as well. A few nights later, a stone appears while she’s walking around the garden, completely freaking her out. The next morning, convinced she’s imagined it, she goes out. The stone’s still there, but in the daylight she’s more curious than afraid, and finds the envelope with a notebook filled with musings of love. Pages and pages of it. “God is behind all things, but all things conceal God. Objects are black and human creatures are opaque. To love a person is to render them transparent.” I think this may have inspired the line, “To love another person is to see the face of God” from the musical. “Lacking this, or lacking air, we suffocate.” So, I guess Marius is saying that love is like oxygen. She finishes the letter just as Theodule wanders by again, and not only thinks him “odious,” but wishes she could throw something at him. All her feelings for Marius are rekindled fully. Interestingly, Hugo compares it to the bread messages tossed over the walls by prison inmates. At long last, nearly a year after they first noticed each other, they meet, speak, embrace, kiss…and learn each others’ names. Whoa! Next up: Gavroche’s strange encounters with his family. Pages covered: 797-811. Images by Jeanniot and Lynd Ward from two unidentified editions of Les Misérables, via the Pont-au-Change illustration gallery. This entry was posted in Book Commentary and tagged Cosette, Halloween, Lark, Marius, Paris, Romance, Rue Plumet, Theodule, Toussaint on October 20, 2013 by Kelson Vibber.